So I recently made this ridiculously easy Fruit Tart with only 6 wholesome ingredients, and of course, I had to share it with you guys. 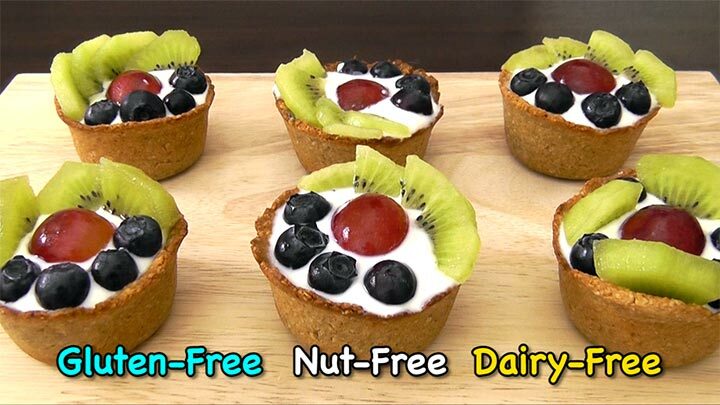 It’s perfect as a healthy dessert for parties or even as your everyday breakfast. I’ve been having the fruit tart for my breakfast the past week. It’s so filling and yummy! It’s gluten free, nut free, can be dairy-free and it’s very high in fiber, protein and low in fat. *I chose grapes, kiwi & blueberries. So let’s start by building the crust. To keep it gluten-free, we want to use oat flour instead of white flour. Adding oats into your diet will provide you with a slow release of energy and help to reduce cravings and overeating. 1) Start by pre-heating the oven to 180 degrees Celsius or 350 degrees Fahrenheit. 2) In a large bowl, add the oat flour, milk, oil and honey. Combine well until you get a thick dough. If you like a hint of spice, you can also add 1 tsp of cinnamon or nutmeg into the mixture or even coconut flakes. 3) Divide the dough equally into 6 parts and press the dough into 6-muffin tray to form the crusts. 4) Really take your time on this. You want to make sure that the base is slightly thicker so that it’ll hold its shape. It’s ok if you don’t have perfect looking crusts. I actually like them looking slightly uneven or different, it gives it a handmade feel and you know that it’s made with love. 5) Once you have your 6 crusts ready, bake in the oven for 25 - 30 minutes until firm and cooked through. 6) They will turn golden brown. Then allow the crust to cool down. 7) Now it’s the fun part. 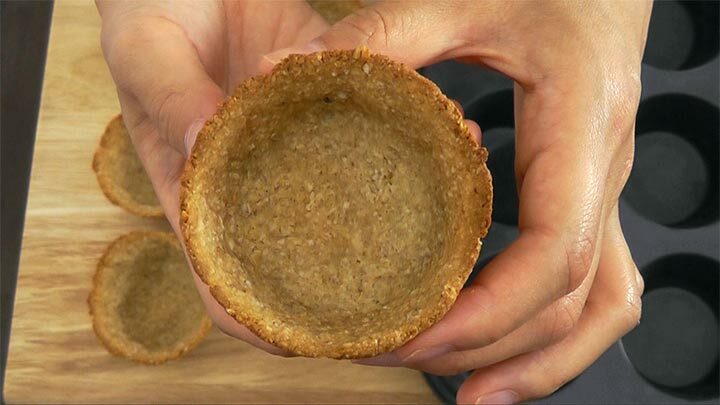 Remove the crusts from the muffin tray, then scoop about 2 tbsp. of greek yoghurt and fill up each crust. If you like to add more flavors to the yoghurt, you can mix it vanilla extract, lemon juice or sweeten it slightly with maple syrup or honey. I’ll keep mine basic. 8) And finally top your tarts with colourful fresh fruits. 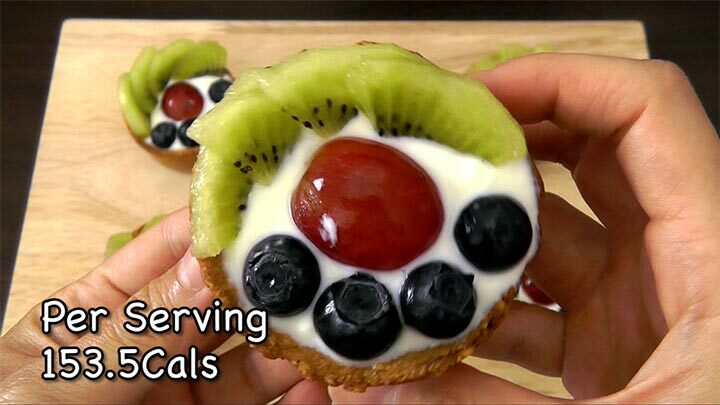 Each tart has about 153 Calories. You get the chewy and crunchy texture from the oat crust, filled with creaminess from the yoghurt topped with sweet refreshing fruits. If you want to keep them, you can make the crusts ahead and don’t fill them up with yoghurt or fruits. Fill it up when you want to serve so that it won’t get soggy. 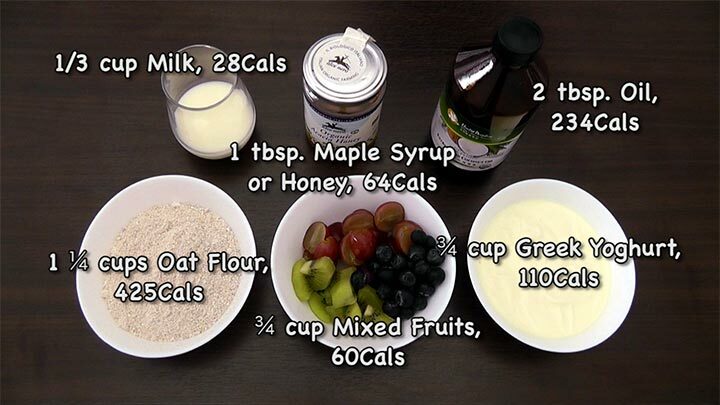 Be sure to try this recipe and serve it for breakfast or as a healthy dessert.